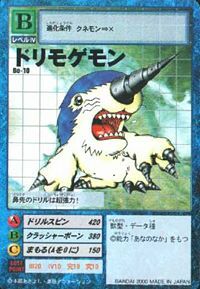 A Digimon that moves underground at high speeds with the gigantic drill attached to its snout. 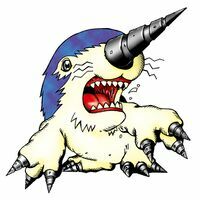 It is an extremely rare Digimon to come across because it is always digging deep underground. 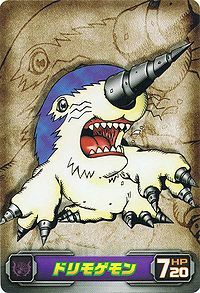 Although it has a meek, shy personality, it is fairly mischievous, and sometimes it takes the favorite bones that Garurumon has buried underground and hides them in different locations. 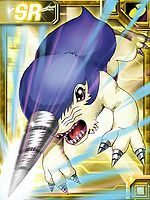 Its Special Moves are attacking the enemy with its gigantic drill (Drill Spin), and throwing the bone it stole from Garurumon (Crasher Bone). An Adult level Digimon who lives deep underground. Its Special Move is Drill Spin. | Dri is short for drill (「ドリル」 Doriru). From Mogera, a genus of mole, as well as a reference to mogura 「土竜（モグラ）」, which means mole. Anime/Manga Digimon Adventure: "Departure - to a New Continent!" Drill Spin  ドリルスピン Doriru Supin Drill Spin/Iron Drill Spin Attacks the enemy with the spinning drill on its head. Crusher Bone  クラッシャーボーン Kurasshā Bōn Bone Crusher Unearths a fossil and tosses it at the foe. Rushes forward and claws at the enemy. During their journey to the Server Continent, the Chosen Children encounter a Drimogemon under the control of a Black Gear in an undersea cave. Kabuterimon destroys the Black Gear, the last one which is seen. A Drimogemon is among the Digimon controlled by an Evil Ring. A Drimogemon Realizes in the human world and tags along with criminals before fighting Daimon Masaru and Thoma H. Norstein. It escaped to the Digital World and evolved into Digmon before being defeated. A Drimogemon was a member of the Bagra Army, serving under Mad Leomon. 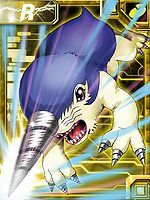 It attacked the Village of Smiles in Green Zone, but was eventually destroyed by Tsurugi Zenjirou using the Star Sword. Drimogemon appears as an obtainable Adult-level Data type Digimon in Digimon World. Several Drimogemon are seen in the Drill Tunnel, doing their usual job, drilling rocks, as they are too busy to attend the Player, until he meets the cook who appears to be in an insufferable pain. The Player engages a battle with that Drimogemon , calming it down and after that, the Player must go to the eastern part of the tunnel to meet another busy Drimogemon, who employs the Player into carrying dirt and trashing it outside the tunnel. This is a great way to stack up on Stats and BITs as each lap your Digimon carries the dirt, several stats will raise and Drimogemon will pay you 500 BITs. After your labor is done and a few weeks pass, the Drimogemon will finish only to be stuck in a giant boulder that your Digimon has to push, leading the path to the Lava Cave. After recruiting Meramon and crossing the moat to the west in the Lava Cave you'll find the same Drimogemon that's again busy drilling. After some other days you can come back and Drimogemon will finally finish its labor, joining to the Village of Beginnings, opening a Treasure Hunt shop. It'll also open a shortcut between Drill Tunnel and the Mount Panorama the Player can easily cross through. Recruiting Drimogemon also makes Gabumon appear in the Misty Trees. The last Drimogemon is found at the south of the Drill Tunnel, who no matter what, is always drilling for a long time. When your city reaches a total of 45-50 Prosperity Points, this Drimogemon will finish drilling and open the path that leads to Leomon's Ancestral Cave, which its the key to recruit Leomon and Nanimon. 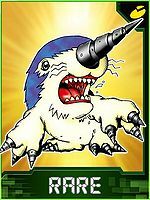 Drimogemon's Digivolution item is the Steel Drill which lets any Child Digimon evolve into Drimogemon. 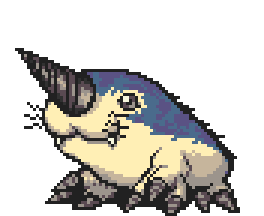 Drimogemon burrows its drill in the ground, only for a bigger drill come out and pierce the enemy, along with several rock splinters that come and strike them. Drimogemon is an obtainable Digimon. Evolves from Gabumon (3-5 DP) and can evolve to Insekimon (0+ DP). Can be evolved from DORUmon if above level 19, attack 90, and qualities 25, or can be found at Login Mountain. Drimogemon is available as a Digimon Medal. 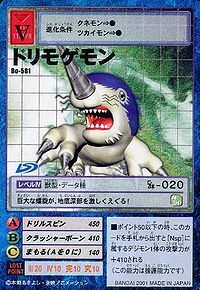 Drimogemon is available as a Digimon Card. Evolves from Kunemon. Can evolve to Giromon. Drimogemon is an enemy Digimon. The drill on the tip of its nose is super powerful! It bores through the depths of the earth with its giant drill! ↑ Digimon Xros Wars: "Xros Heart! Our "King"!!" This page was last modified on 11 March 2019, at 22:23.